One of the best things about studying at SPICED Academy is its location, Berlin. There’s something for everyone in this big, beautiful city. To tell us all about it, we recently had Berta Luise Heide from Walk This Way come to conduct an interactive Intro to Berlin workshop for our brand new cohort of international students! The workshop kicked off with an interactive exercise on “what is a popular stereotype of Germany or your own country?”. It was fun to listen to different perspectives from students and also learn a little something about where they’re from. Next, Berta gave us an overview of the geography of Berlin, its 12 districts and 23 neighborhoods (a nice little tidbit to know for your next pub quiz!). Then came the Top 5, our favorite part! Berta reviewed various categories of “Top 5 Things” in Berlin, one of her most popular recommendations. There was the top 5 things to do in Berlin, top 5 things to eat and drink and, especially created for our workshop, the top 5 German movies, all of them shot in Berlin! The movies are a nice way for our students to reminisce Berlin if their developer jobs take them to faraway places. The top 5 theme was rounded off with a personalized recommendation of top 5 things to do in Schöneberg, the neighborhood in which SPICED is located. The workshop ended with a lively question & answer round about the many things that newcomers might find useful, from where to find toothpaste to how to get past the long lines at Berghain (there is no choice but to wait in line, for those curious). As one student said, this was a “great intro to what to do in Berlin!”. We couldn’t have said it any better. Berta is a publisher of travel guides and a marketing and public relations professional who runs her own company called Walk This Way. Walk this Way offers curated travel guides for – so far – the districts of Neukölln and Kreuzberg in Berlin. The mini pocket map is called BertaBerlin! Berta came up with this idea when she noticed a guest of hers googling for ideas on what to see and do in Berlin and feeling a bit overwhelmed. Born in Berlin and having lived in Berlin and around the world, she thought it would be good to share her knowledge of this ever-changing city. Recently she also published QueerBerlin, a travel guide for LGBT-friendly spots in Berlin. Interested in exploring how to code? 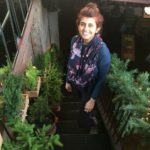 Contact Shilpa, Director of Programs & Community at shilpa@spiced-academy.com.